Last month Apple announced new phones and the iPad Pro. Now it’s Google’s turn. Google has two new phones, the Nexus 5X and the Nexus 6P. The chief advantage of a Nexus device is that it is first to get new operating systems. These phones come with the latest Marshmallow version of Android, announced a few months ago. When the next version of Android comes out, these phones will be first in line for them. And the upgrades come direct from Google. Other Android phones have to wait until the phone’s manufacturer releases a version of Android for the phone, and your carrier approves and transmits it out to you. Some current phones won’t get Marshmallow for months; some older phones not at all. The 5X is made by South Korea’s LG and sports a 5.2 inch display. The 6P, made by Chinese maker Huawei, sports a bigger 5.7 inch screen. Both phones have a fingerprint reader for secure access, high resolution front and back cameras, and come unlocked so they can be used on all the major US carriers including Verizon, AT&T, T-Mobile and Sprint. And both phones can be used on Google’s own service, Project Fi. Fi runs on both the Sprint and T-Mobile networks, switching off from those and Wi-Fi, whichever is the stronger network at the moment. The 5X comes in 16 gigabyte and 32 gigabyte models starting at $379. The 6P comes in 32 gigabyte, 64 gigabyte and 128 gigabyte models starting at $499. Both phones use the new C type USB connector. This small connector does not have a right way and a wrong way to go in, saving us from the agony of trying to plug in an upside down cable. They also come with a $50 Google Play credit if ordered before Dec. 15. And also 90 days of Google Music service. And for the first time, Google is offering a two-year protection program, Google Protect, guarding against mechanical breakdown or accidental damage for the two phones. It is $69 for the 5X, and $89 for the 6P. No word yet on if, or how much, of a deductible there might be. Google also upgraded its Chromecasts. Our Chromecast is the best $35 item we’ve ever bought. Google has sold 20 million of them. Chromecast hooks to your TV. You use an app on your phone, tablet or computer to select something to watch from Netflix, Hulu, TV networks and many other sources. You push a button on the app, and it tells the Chromecast to go get that program. Once that’s done, the phone is no longer required. It can even leave the house and the program continues. Although with the phone, you can pause the program and resume it. You can even do that from an Android Wear watch. Choosing and controlling my TV from my phone has always given me the strongest “we are living in the future” moments I’ve ever had. Google updated the Chromecast with one that receives Wi-Fi signals better. It even lets you play some games on your TV. And a new version of Google Photos app lets you display your photos on the TV so you can share them with others. It’s sort of a 21st Century slide show to entertain dinner guests. There also is an entirely new Audio Chromecast. It attaches to speakers and lets apps send it music via Wi-Fi. It plans to do for music, what Chromecast did for video. Google also previewed a new tablet coming out before Christmas. The Pixel Tablet is a high-end Android tablet with an optional keyboard that attaches with magnets. The Pixel is clearly intended to compete with the newly announced iPad Pro, and Microsoft’s Surface. Google also announced a family music plan, similar to Apple’s and for the same price, $15 a month. 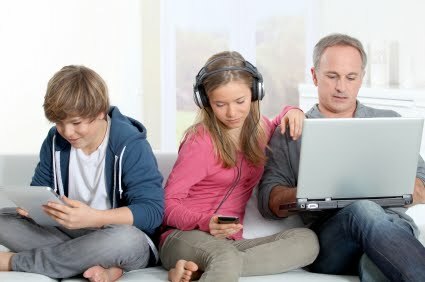 It will stream music to your device and recommend music for each family member depending on their musical tastes. A new photo app lets users copy photos to another’s phone. That way, if family members all take pictures while on vacation, they can copy the photos into one collection. And other family member, like grandma, can subscribe to the photos and see them and be notified when there are new ones.